My curiosity was ignited. I opened the link for the gallery show announcement, Harmony in Red_Paige Dansinger at SooLOCAL, August 16 – September 15, 2013 in Minneapolis, Minnesota. Paige Dansinger, is an artist, art historian, museum experience and tech genius who co-developed the DrawArt app – see her visit to the Metropolitan Museum of Art. Included is a video introducing the Matisse masterpiece of the Reclining Odalisque (Harmony in Red) 1927 which is at the Metropolitan Museum of Art in New York City. The masterpiece disappears as the screen is wiped red. Slowly emerges an interpretation by Paige with thick, thin, tickling lines inviting. To observe the creation is magical. To analyze the sequence of colors is a mental puzzle. Layer upon layer, colors and lines, until a masterpiece is re-interpreted in modern form – a digital experience as well as including the portrait of the artist interpreter. Hmm, do you have a file on the Acropolis, Parthenon,Greece … ? No but I’d draw one.. I’d draw your museum collection. 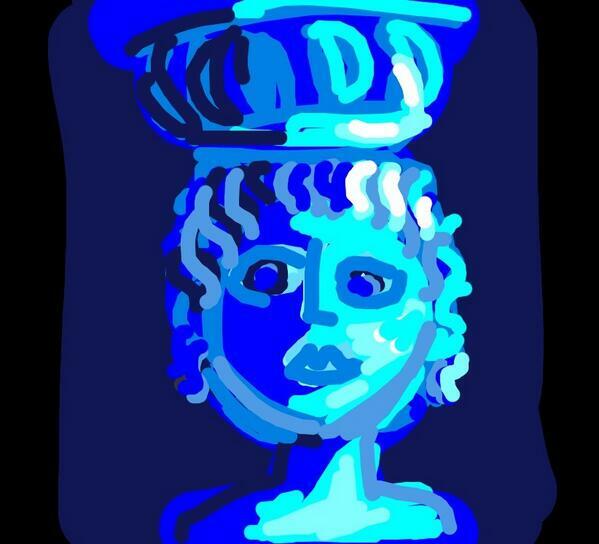 Via Twitter, we exchanged images and in a matter of minutes, a Paige creation of the a Caryatid (illustration above) that inspires so many around the world and the following day, the Caryatid sisters at the Acropolis Museum (illustration below). To experience an artist at work creating from their own imagination, observing their surroundings or from a photograph is the gift. For in observing the creative process the power and skill of the artist is revealed. Their interpretation, their analysis, their storytelling is the legacy that allows the conversation, exchange with the art appreciator. It is this exchange that is visceral as well as timeless. After oral storytelling, visual art becomes the enduring immortal teacher of history, community, geography, science, politics, religion, wars, peace and ultimately how to live life. engage, play, educate ignite you. As you follow Paige on Twitter, Facebook, Instagram be inspired by a new experience with the masters through a modern master in her own right. To own a piece of art by Paige, inquire directly with Paige for digital and canvas commissions as well as available pieces at the gallery. Paige has also designed hand painted dinner and dessert plates to bring the museum experience to the dinner conversation. Paige is innovative, imaginative, provocative in her approach to art. Through technology and social media, Paige is engaging, teaching, connecting a global audience to the future potential of museums, the actual experience with art. She moves beyond archives in submerged dark basements, physical walls, national borders by introducing a dynamic fluid world of art appreciation. For it is a universal truth of human nature, that to survive we must express ourselves and rely on the stories of our elders and therefore, art, in all forms, is essential to living. The question is, do you own a Paige Dansinger masterpiece? 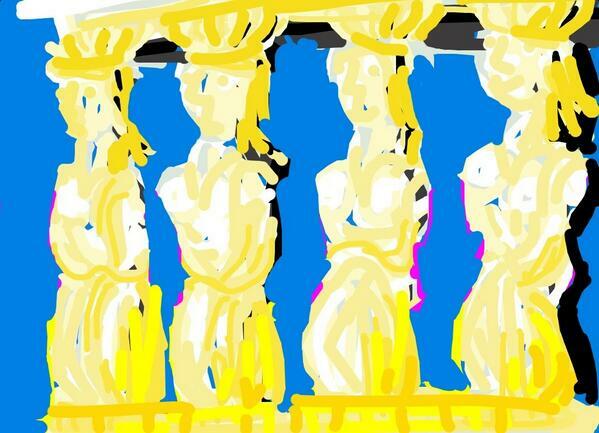 Tags: Acropolis, Acropolis Museum, Architecture, art appreciation, art education, arts, British Museum, Caryatid, DrawArt app, DrawArt.MuseumPaige.com, Elizabeth Rynecki, engaging, experience art, Facebook, Future of museums, gaming, Greece, illustration, Innovation, Instagram, Matisse, Paige Dansinger, social media, teaching, technology, Twitter, videogames. Bookmark the permalink.